Our Calgary EverLine location provides professional, high quality road making services to all of Calgary and surrounding communities. We use premium materials and equipment and can work within your business’s budget. EverLine Coatings supplies outdoor line painting for parking lots and roads for the entire Calgary area. We began as specialists in outdoor parking line painting giving us the experience and equipment to perform any road marking job needed. Our Calgary location employs multiple line painting crews allowing us to work on 3 to 4 locations at the same time, and allows us to ensure all our line painting projects are completed on time. Our large number of experienced and professional Calgary road marking crews allows us to provide a quick response to any line painting project you may need done on short notice. If you require your outdoor parking lot line painting done immediately and professionally then we are ready to serve you. We are also proud to offer Calgary businesses high quality work at one of the best prices due to the fact we are one of the largest paint buyers in Alberta. 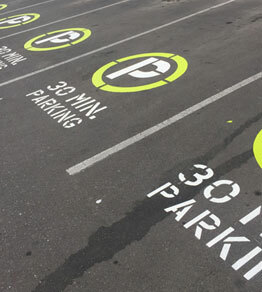 Please contact our Calgary office directly for more information on our outdoor parking lot line painting services. For an awesome experience a great company has to get all the ingredients just right. What makes us different and why you should choose EverLine Coatings as your line painting and asphalt maintenance company for your property, is we set out to build a company that stands out. How do we do it? We have three key differentiators. Number one, our high quality is systemized. As we work through the core quality system on your project. Built into our daily processes are key quality checks that make sure our crew cannot leave site without signing off on great work. It’s built into our DNA as a company our work is on display and we need to leave the site proud of it. Number two, we are constantly innovating. There’s always a better way. Our commitment to personal and professional growth as a company leads to the utilization of new products, new application methods and improving on tried-and-true methods. It creates opportunities for your parking lot to look great for longer and for the best value. Number three, we answer the call. We know that our industry can often have last-minute requests. To the absolute best of our abilities we will be there for each of those demands. Responsiveness, efficiency and execution are the name of the game here. Each EverLine location built the ability to respond to the highest demands of our clients on a budget, as well as a deadline. If we miss your call we’ll get back to you as fast as humanly possible. We will get the job done for you. At EverLine we use TBL Durables line painting products to ensure high quality and extremely durable line painting projects. The use of TBL Durables is one of the reasons why we stand out as a premiere line painting company in Canada. Some of the advantages of TBL Durables include longer lifespan, faster drying and resistant to harsher weather conditions. To learn more about our TBL Durables products please click here. At EverLine we have decades of experience in parking lot line painting services, making us the foremost experts in Canada. No matter the type of parking lot painting service you need we’ve already done and we have the know-how. Need any kind of repaint done? We can repaint parking lot lines, curbs, stencils (all types and colours), crosswalks, stop bars, arrows, handicap spots, you name it we can handle it. What about new parking lot layouts? We love these. Our experience allows us to help you plan your new layout, and once the layout is done we execute it with quality and professionalism. Our new parking lot layout projects always looks fantastic and exceed expectations. How about roads and streets? At EverLine we have experience painting municipal roads and streets as well. Road markings, crosswalks, stop bars, arrows in intersections, customized stenciling and signs, we do it all. If you are having road marking services performed in the near future there are a few things your business can do before we arrive to ensure timely and quality painting. Ensuring that the parking lot we are painting has been swept is important, at EverLine we also provide parking lot sweeping services and can help with this. Please make sure the parking lot has been cleared of vehicles, or at least as many as possible. It is also important that the parking lot does not have any obstacles or debris present as this can obstruct our equipment. Finally please ensure any tenants that line painting is being completed, this helps our team by preventing any unnecessary stoppages or distractions. At EverLine Coatings and Services we price out our parking lot line painting projects on a per-job basis. This means that our rates will fluctuate based on volume, difficulty, traffic and materials being used on site. We have experience working within a wide range of budgets and are very competitively priced. To receive a better idea of what your parking lot line painting project may cost please contact us.